NYC to Guildford. That’s the one-way trip lead programmer and 12-year Epic veteran James Golding has made to join Epic Games’ first-ever UK studio. The new outfit is built on the foundations of Pitbull Studio, who’ve been working with the Gears lot on Unreal Engine 4 for the last three years. Pitbull will now be “fully integrated” into Epic’s international studio set-up, and act as HQ for Unreal Engine 4 development in the UK. Over their five year history, Pitbull’s staff have been dotted between Guildford, Leamington Spa and Sunderland, with an emphasis on the latter. 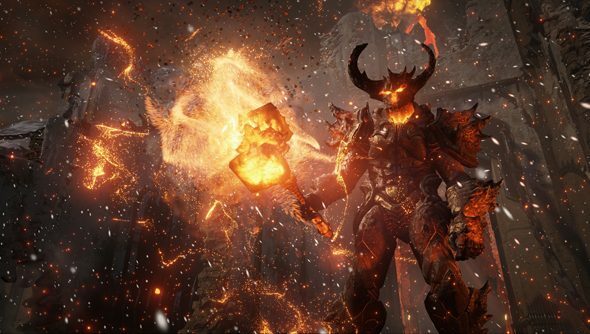 Their programmers and artists have contributed to the new Unreal Engine’s feature set in rendering, audio, physics, UI and the like – and it sounds like they’ll continue down that line of work. “Setting up a bespoke Epic presence here and fully utilizing the Pitbull team as part of that enables us to support Unreal Engine 4 developers across Europe on an entirely new level,” said Epic European territory manager Mike Gamble. It just goes to show, doesn’t it? If you try to kill something it’ll split into two. Although Crytek UK dissolved last week, a new Deep Silver studio sprung up in its place to finish work on Homefront: The Revolution. Stay strong, UK games industry.